Hello and good evening everyone! 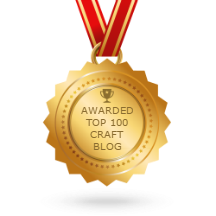 I’m Halak and I’m super thrilled to be writing this post for hndmd.in. 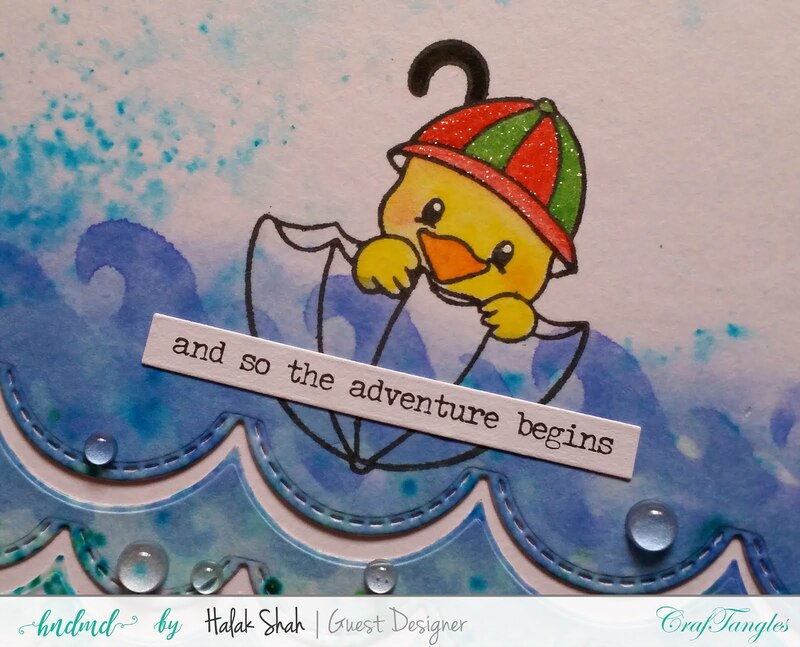 This adorable little chickie is from the CrafTangles Photopolymer Stamp – Rain or Shine set. Stamped the chickie in Versafine black ink. 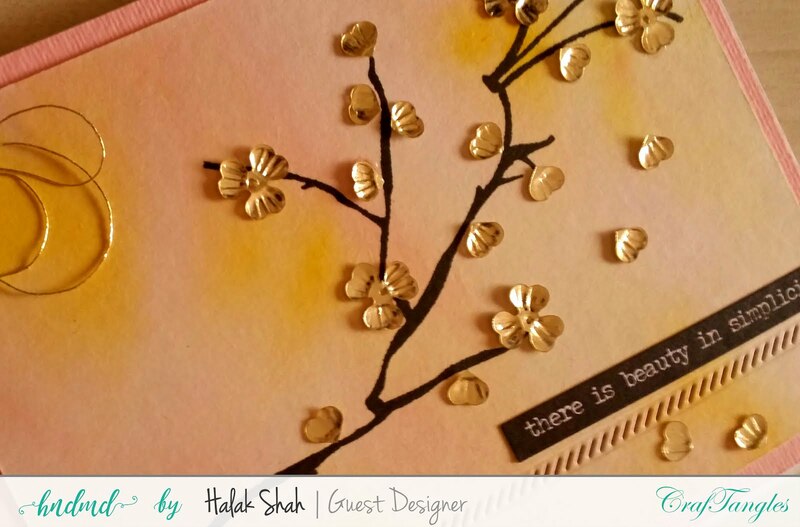 Used the CrafTangles - Nature – Create a Scene stencil with Distress Ink (Blueprint Sketch) and stenciled the wave design. Next, I used Color Burst (Ultramarine Blue & Pthalo Green) in the background and spritzed some water. Once it dried, I used MFT Stitched Scallop Edges die and adhered the cut pieces onto white card base. Added a sticker sentiment from Tim Holtz Small Talk and colored the chickie using Staedtler Luna color pencils. Lastly, added acrylic dot embellishments and finished it off with some glitter to the chickie hat. I loved the Golden Wildflowers - Sequin Mix that was sent to me as a part of the kit. Those gorgeous blooms can be used as-is or can be trimmed into lovely heart shaped petals! Created background using Brusho Crystal Colors (Lemon & Rose Red). Once that dried, I stamped a tree branch from Altenew – Vintage Flowers stamp set in Versafine. Added a border using Lawn Fawn – Stitched Borders die. Matted onto pink cardstock and finally adhered onto white card base. This is the fun part… cut up a bunch of those lovely Wildflowers and adhered them to the tree branch along with some whole flower sequins. Added sticker sentiment from Tim Holtz Small Talk and bunched up some golden thread in top left corner. Completed the project by adding a teeny tiny butterfly to the bunched up thread. Love. A miniature mixed-media piece using fun shaker elements. Adhered the CrafTangles Shaker Elements – Wooden Hearts to cardstock and coated the whole thing in Sakura White Gesso. I used a bunch of Color Bursts, Staedtler Color Pencils and Distress Inks to add color to the background. Used TCW stencils with ink & modeling paste to add texture and interest. 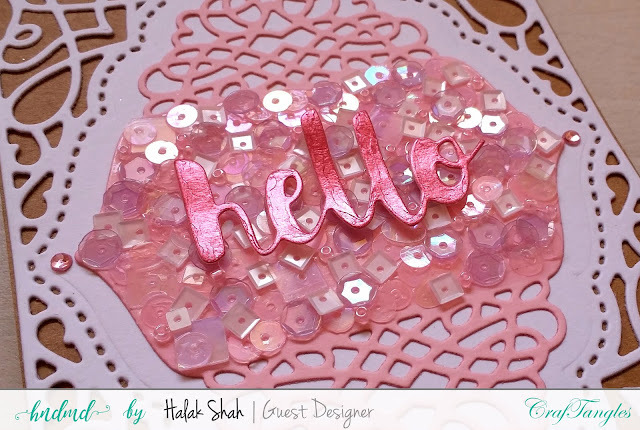 Added a bunch of sequins and beads using the Sparkling Shimmer – CrafTangles Sequin and Bead mix. Added a bunch of crackle accent dots, colored rhinestones and bits of washi tape. Also added a sentiment using the washi tape and mini punched out butterflies in white. 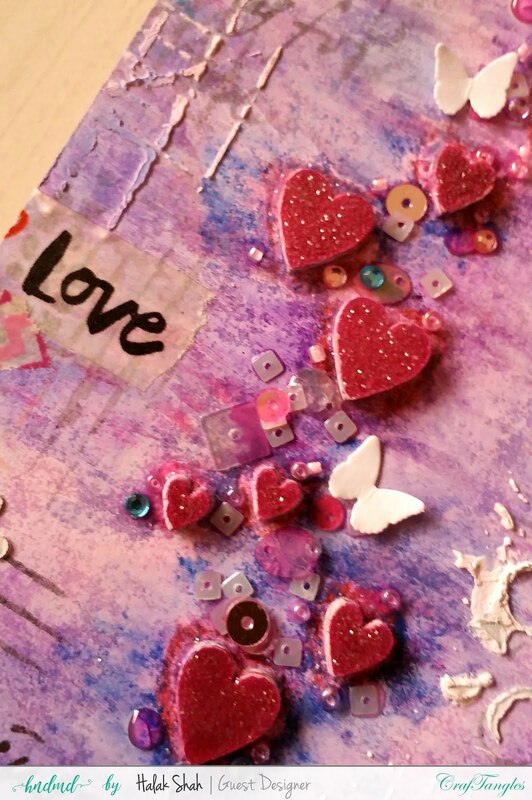 Finally, colored the hearts using magenta colored oil paint and sprinkled fine glitter over them. 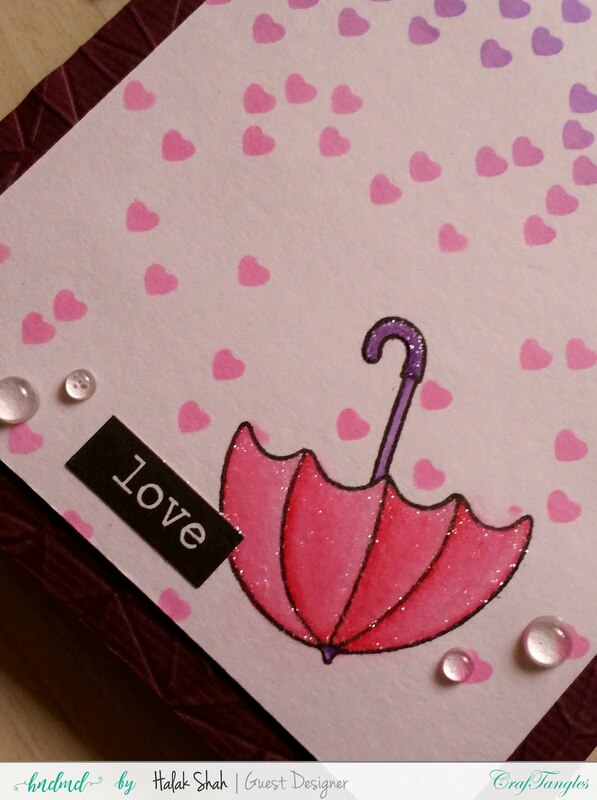 Stamped the umbrella stamp using the CrafTangles Photopolymer Stamp – Rain or Shine set in Versafine. Colored the stamp using Staedtler color pencils and coated the umbrella and the handle in fine glitter. 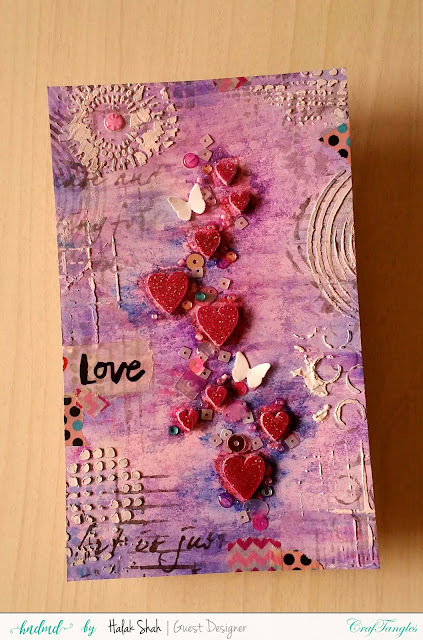 Used the CrafTangles Stencil – Raining Hearts with distress inks (Wilted Violet & Picked Raspberry) and created the background. Embossed wine colored cardstock using American Crafts Next Level Embossing Folder – Gemstone, tore an edge and used it as a mat for my project. Matted the project onto white card base and glitter coated the white portion visible above the torn edge. Finished it off with a sentiment from Tim Holtz Big Talk stickers and some acrylic dots. These two projects are foil-related projects. 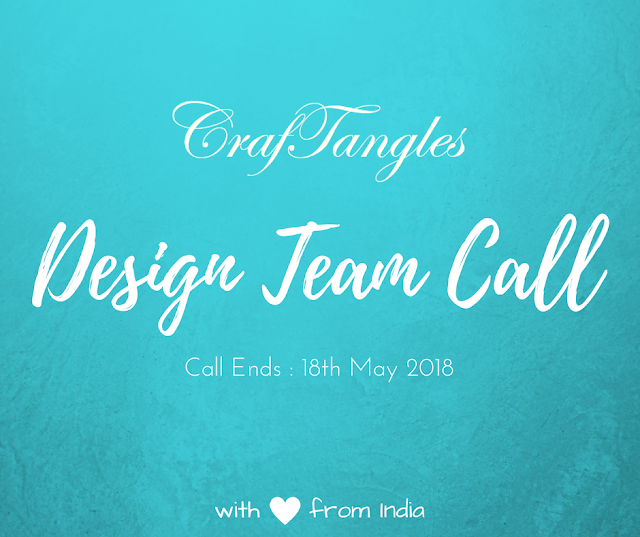 If you think that you need a laminator and a laser printer for foiling and there is no other way… think again! So, how do we foil? Really simple. Apply some glue (any glue) onto your cardstock. Adhere foil to it. 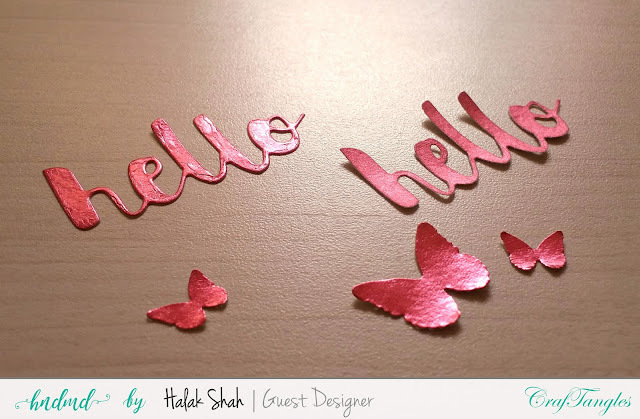 I have used Pink Reactive Foil Transfer Sheets by CrafTangles. If it is a wet glue, give it some time to dry (I used fevicol / PVA glue). Sandwich that foil adhered piece between some heavy-duty cardstock and run it once through your Big Shot / Die-cutting Machine. 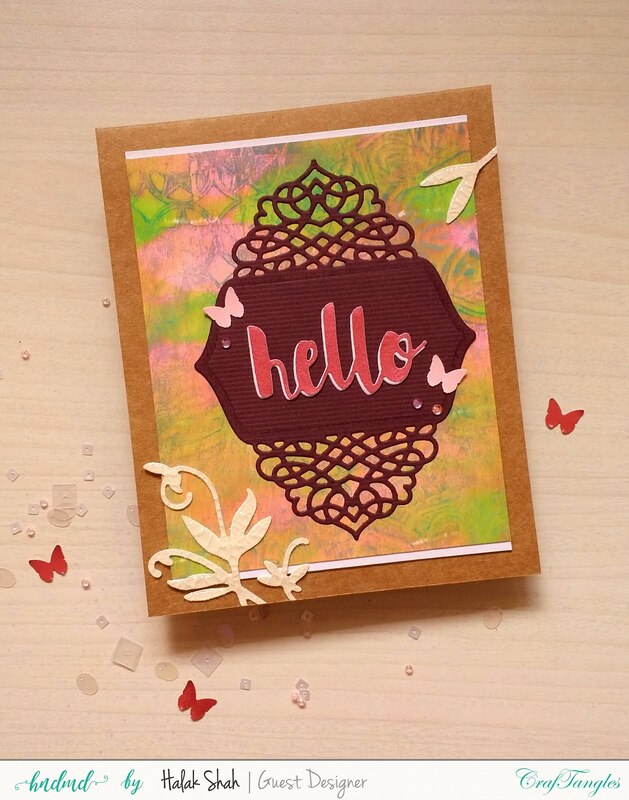 Peel away the top plastic sheet and use it to die-cut some lovely sentiments, backgrounds, borders, etc. What’s really cool here is that if you run the foil through your machine two more times, it gets this fantastic matte look. I’ve used both the versions for two separate cards. 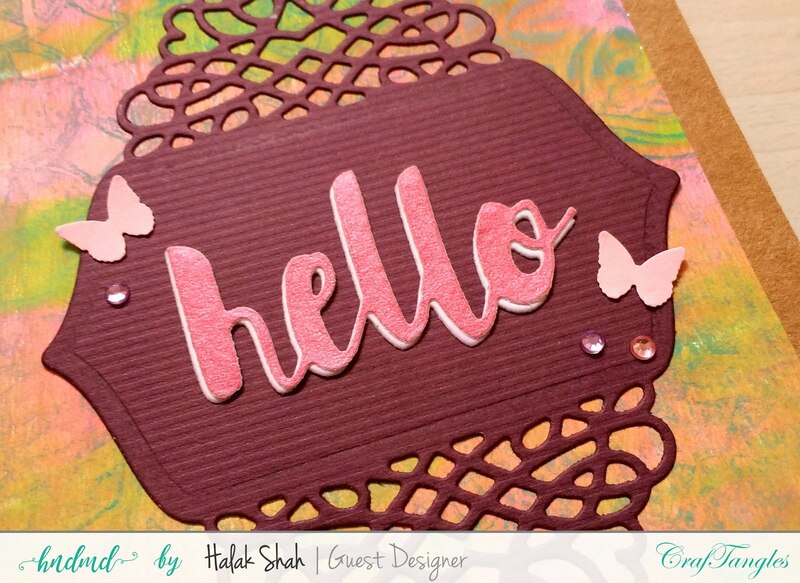 Cut out card base (white) and central portion (pink) using Spellbinders A2 – Tranquil Moments die. Used sequins and beads from CrafTangles – Enchanted Lilac – Sequin and Bead Mixes and created the base on which I would lay my foil-covered die-cut. Next, I cut out a sentiment using Simon Says Stamp – Painted Hello Die and adhered it to the sparkly sequin base. Added pink rhinestones to the sides and matted onto Kraft cardstock. Like I said, I also used a matte version of the foiled piece with the exact same die-cut. I won’t delve much into the details since the central concept is pretty much the same and all I’ve changed is the background (gelli print) and added an additional die-cut coated in crackle accents. Look how awesome the matte version of the foil is! 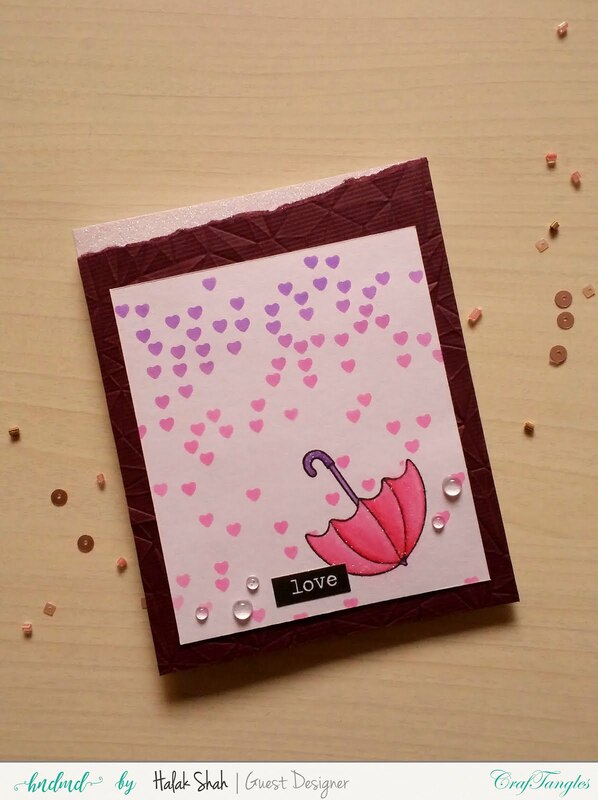 Use a thick cardstock when you are working with a lot of water. I used a 300 gsm cardstock while working with pigment powders. Always prime your mixed media project base with gesso. Without it, the paper will just crumble away amidst the layers of color and water. 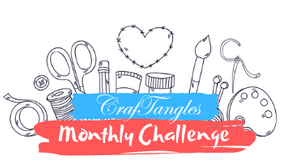 I hope you liked my projects and that they inspired you to learn and try something new! 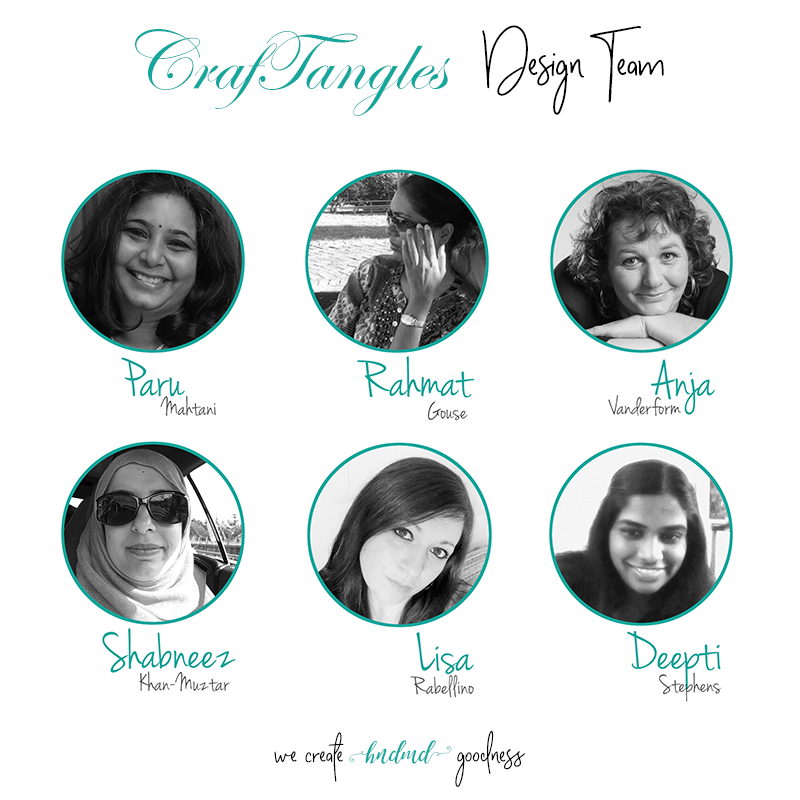 Beautiful work my dear friend :) so many wonderful ideas! Kudos. Thanks for sharing. Beautiful projects Halak. Thanks for demonstrating this new way of using foil!